In the previous post I wrote about the knotted dress I'm sewing for a friend. 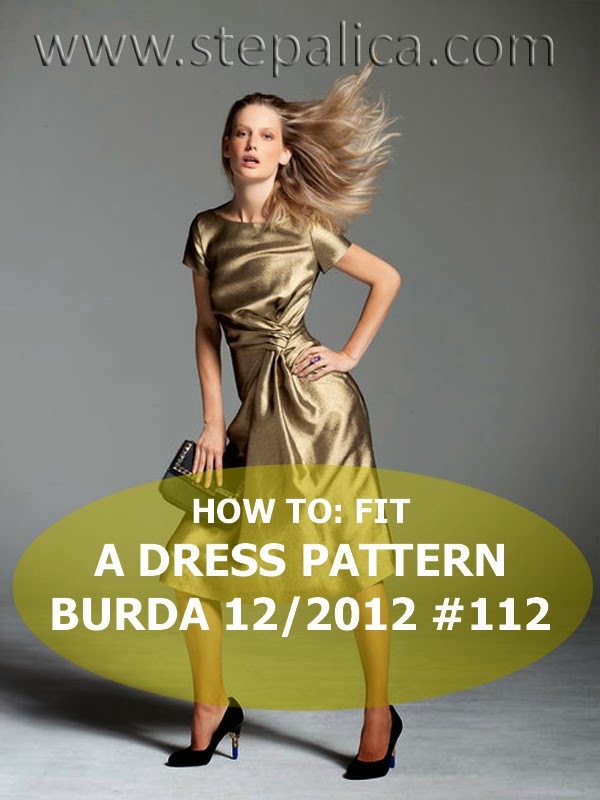 After I published the article we had a fitting where we altered the pattern on several places to make it fit nicely. 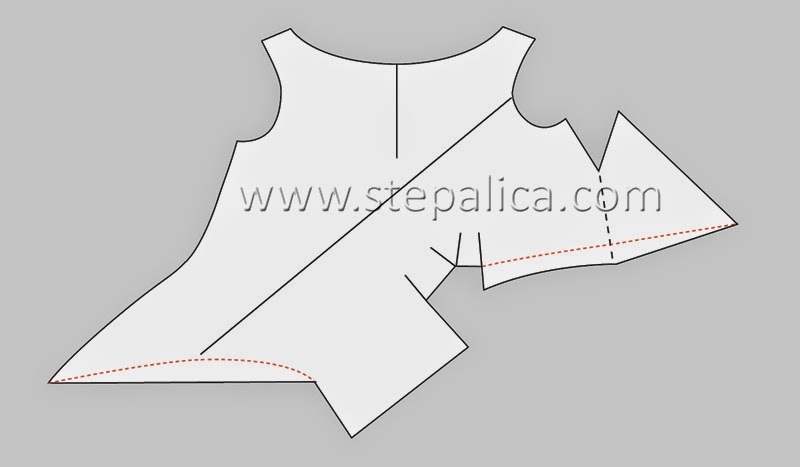 In my opinion, the major issue this pattern has is its length, since it was drafted for extremely tall women, and the bodice panels need to be cropped to make the dress fit. The friend is 175 cm tall, but the front and back needed to be cropped on several places. I have to add that the friend didn't think the bulky knot was an issue, so we decided to fit the pattern and make the dress. 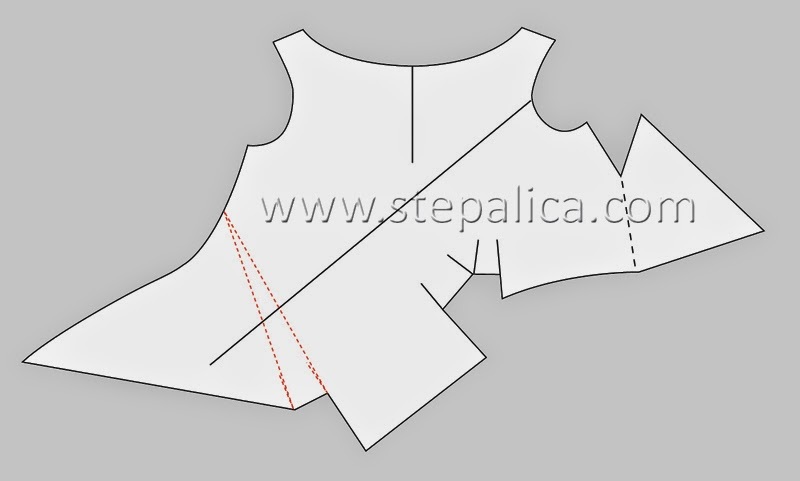 I will describe the changes we did on the pattern, but I have to warn you not to take this tutorial as a definite user manual; I strongly advise you to make a muslin first and fit the pattern according to your body. You can use this tutorial as an idea reference. We made the alterations in several phases. First we adjusted the armholes so that we could see how much and where the further alterations were required. This is how the original pattern looks. I won't talk about the sewing process now, but I might write about it when I make the dress. I altered the armhole and reduced some of the bodice length by cropping the bodice between the neckline and underarm. I drew two parallel lines as shown on the picture below, distanced approximately 2 cm. 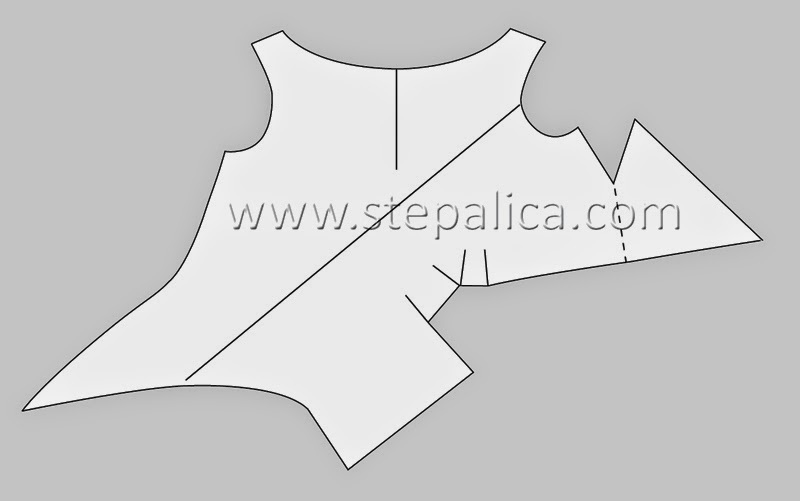 Then I cut the pattern along the lines and joined the upper and lower parts together, thus removing the extra length. I applied the same alteration on the back bodice panels. I also cropped the sleeves by removing the length from the sleeve head. Then I altered the shoulder seams. 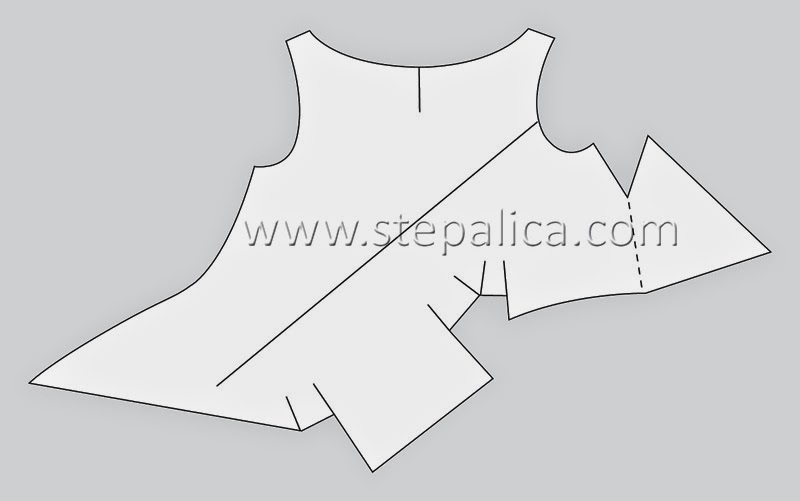 I cut the pattern at the shoulder and rotated the cut-off piece to the side, keeping the armhole curve continuous. This widened the shoulder seam while kept the armhole intact. 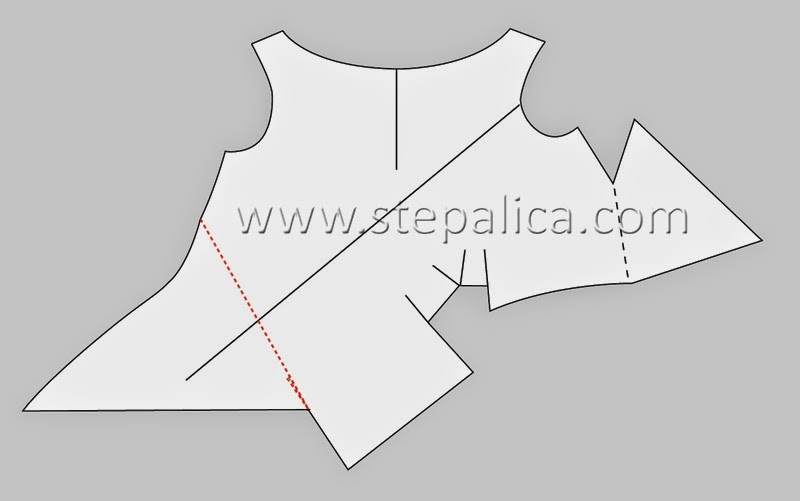 I adjusted the shoulder seam by redrawing a line that connected the neckline with the armhole. I made the same alteration on the back bodice panel. Once the armholes were adjusted, the pattern looked much better. There was still some extra fabric length, but not as much on the breast as it was on the waist. 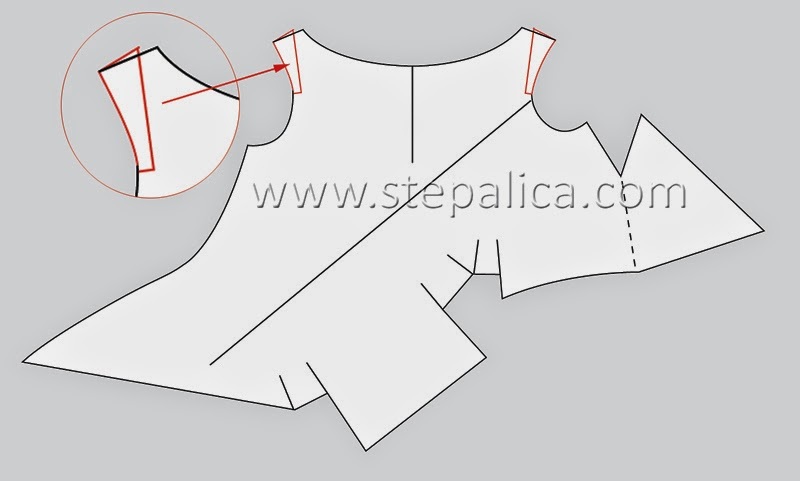 A bit of the extra fabric was removed by closing the pleat on the left side of the bodice. I pinned the fabric in places where it seemed appropriate and then transferred the changes to the paper pattern. The result was as shown on the pics below - the left pleat was closed. After this alteration you could see the dress would look great. 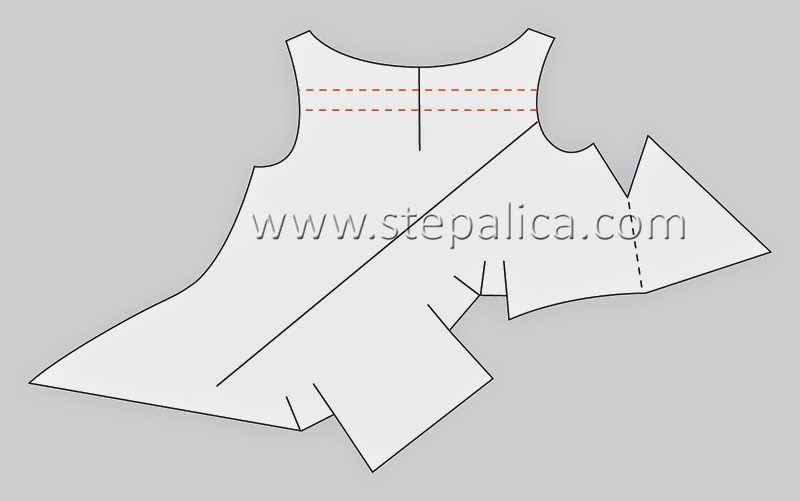 There was some extra length of fabric left along the bias seam, so we removed it as shown on the pictures below. Finally, here is a comparison of the pattern before and after our interventions. What you can't see on the pictures are alterations I did on the remaining pleats. I lengthened the center pleat and added a new one that goes from the right breast (left side of the pattern on the picture) towards the center of the knot gathering. With these changes, the dress looked great and the friend was pleased. Note that we haven't altered the length of the side seams. I am yet to sew the dress and we should have another fitting then. The friend has left to a vacation meanwhile, so I'll write the next post of this series after she's back home. Amazing skills! Not sure I would have the patience. Love your before and after comparison!